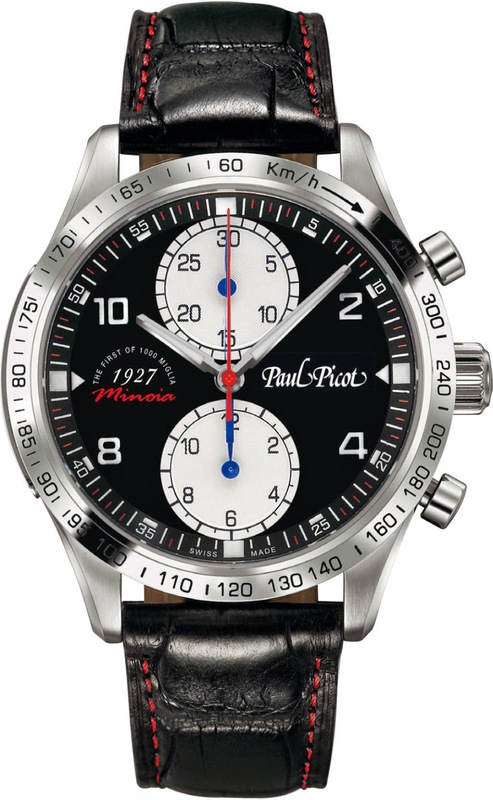 Swiss watch maker Paul Picot presents a limited edition of 100 of its Gentleman chronograph watches dedicated to the legendary racing driver Ferdinando “Nando” Minoia (1884-1940). A true “Gentleman driver” and pioneer of motor racing, head test driver and first driver for the automotive manufacturers Isotta Fraschini (1905-1912), FIAT (1919-21), Lorraine-Dietrich, OM, Bugatti, Daimler-Benz, Renault, Mercedes-Benz, Steyr, La Salle and Alfa-Romeo. To the English he was the “Master of driving art”, to the French the unbeatable “metteur au point” and to the Germans “Gross und Prominent”. He was the world’s first professional racing driver. In 1927 he won the first “Millemiglia” as first driver in an OM—Officine Meccaniche—123 Superba, at the average speed of 77kmph, in 21 hours, 4 minutes and 48 seconds. He won the European Drivers’ Championship at the wheel of an Alfa Romeo. A pioneer of motor racing, Minoia is cited by historians as being the most talented driver of the period from 1907 to 1931. He had an exceptionally long and varied career. The «Minoia» Gentleman Chrono Limited Edition comes in 43 mm stainless steel case with tachymeter bezel and the black dial with silver counters is inspired by the dials on the OM Superba racing car. As a tribute to the legendary racing driver, the dial is engraved with the text THE FIRST OF 1000 MIGLIA -1927 – MINOIA at 9’o clock. Hand-stitched alligator strap with Paul Picot branded folding clasp.